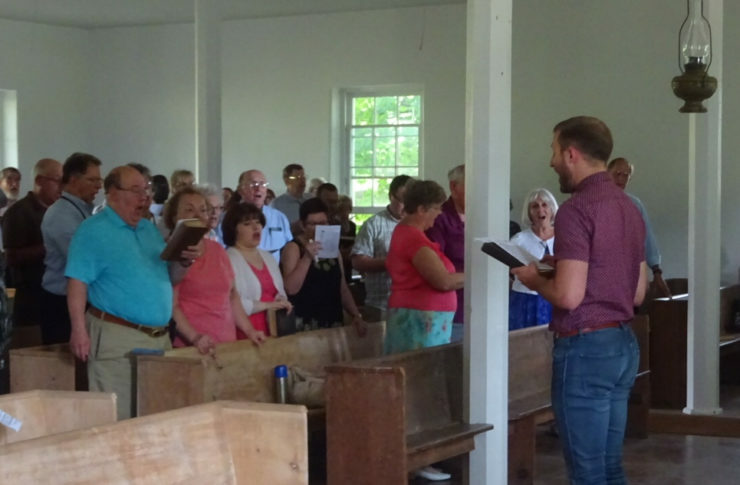 I took the opportunity on Sunday afternoon, July 15, to wander down to Ringgold, Maryland, to the historic Ringgold Meeting House for their annual hymn sing. I had never attended before so was eager to see what made this an annual Brethren in Christ tradition. Upon arrival, an elderly man named Gerald Wingert came walking out of the cemetery nearby to greet me. “That’s my great grandpa’s grave over there,” he said, pointing to a grave with an ornamental lantern hanging near it. After introducing myself and telling him my home congregation was Iron Springs, he confessed that many years before, he had traveled down from Messiah College to worship there and that his dad, Milton, had once been a church trustee in the early days of our church’s history. He also told of a day when, while in the old church building across the creek, some church kids had discovered a copperhead snake down on the church bank, and his dad had to go assure their safety. The ordained ministers in attendance facing the congregation. Gerald Wingert, referenced in Kevin’s article, is at the left of the photo. We turned out attention to the meeting house, and Gerald informed me that the two doors into the building had a special purpose. The men and boys entered through the one on the left, while the ladies and younger girls used the right door. During worship services, they sat segregated in that fashion with an aisle between. As we entered the meeting house, I noticed its rustic yet simple beauty: unstained wood benches, with groups of benches facing in three directions and a bench up front facing the congregation. I later learned that the facing bench was where the ordained ministers sat. The three-floor meeting house had no electricity. The worship area was lit by two gas oil lamps hanging from 18-inch hooks in the ceiling and was heated by a single heating stove on the left side. Air conditioning came from hand fans and from opening the many windows and letting the cross-breeze come through. Other floors of the meeting house contained a small nursery with wooden bassinette, a sleeping area upstairs (since love feast/communion in the early times was a three- to four-day affair and some who came a distance needed a place to stay), and an area downstairs for love feast/communion and meals as needed. The single fireplace downstairs was used for cooking purposes. Dave Perry, worship arts pastor at Grantham (PA) Brethren in Christ, leads the hymn sing. Once the hymn sing began, I realized I was about to experience a capella singing as they used to do it in the early Brethren in Christ worship services. There was no piano, no organ – just a worship leader with a pitch pipe. From the first line of “Blessed Assurance,” I realized that the people present (around 100 strong) knew how to sing in four-part harmony and that the acoustics in this all-wood meeting house were exceptional. A heavenly chorus sang “Great Is Thy Faithfulness,” “I Love to Tell the Story,” “When We All Get to Heaven,” “Ring the Bells of Heaven,” and “It Is Well With My Soul” [see video for sample of singing]. 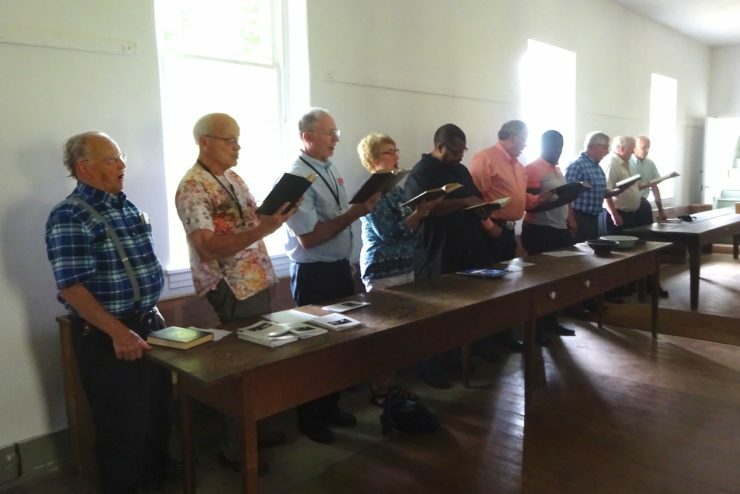 The singing portion of the afternoon was interspersed with several Brethren in Christ pastors speaking in 5-10-minute segments and the Brethren in Christ Historical Society giving brief history lessons about the Ringgold Meeting House. Then, the hymn singing would begin again. 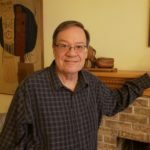 *Kevin Bream is worship director at the Iron Springs Brethren in Christ Church, Fairfield, PA. 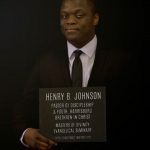 He originally wrote this article for his church newsletter. 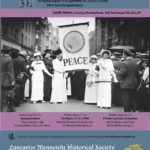 Photos and video by Harriet Sider Bicksler, Historical Society editor.